Thanks to everyone who stopped by the booth at this year’s Fiber Festival of New England. We had great crowds both days of the festival and I’m still readjusting to my usual work schedule. Show prep can be a bit hectic and I’m enjoying being able to plan new things and do regular, everyday tasks. Like blogging! Which I am very, very bad about doing regularly. Now that I have a new phone with an excellent camera, I’m hoping to at least keep you apprised of my latest projects. I’m back at the dye pots this week and will photographing and listing new items by Friday. Make Way for New Colorways! I’m getting ready to release a new colorway line in September. 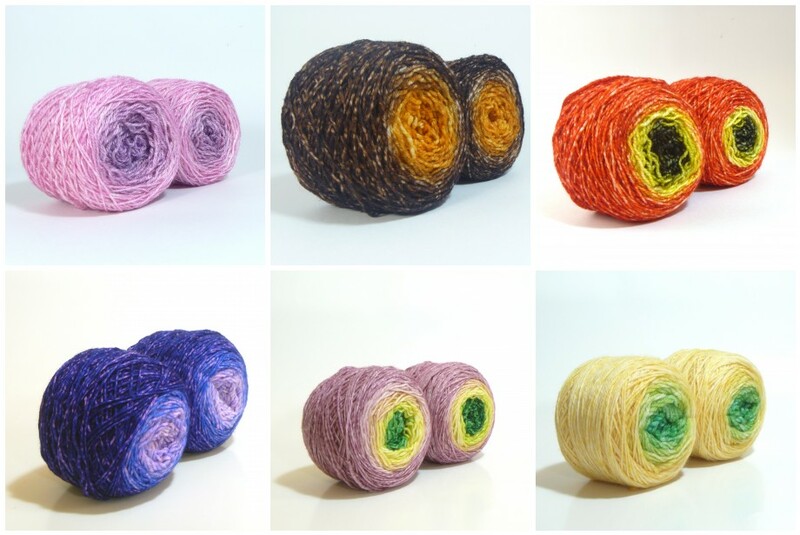 To make some room, I’m discontinuing some colorways and moving others to dyed-to-order only. If they’re not in stock now, you will be able to order any of the discontinued colorways dyed-to-order from now until August 31, 2014. The Annual Big Summer Sale will go into effect on August 1, 2014. Everything in stock (including Clearance items!) will be 15% off all month. Stay tuned for hints, and sneak peeks of the new colorway line! In celebration of the recently released pattern, Log Cabin Socks (designed by Mara Marzocchi with Boundless Sock) I’m giving away this great sock kit! 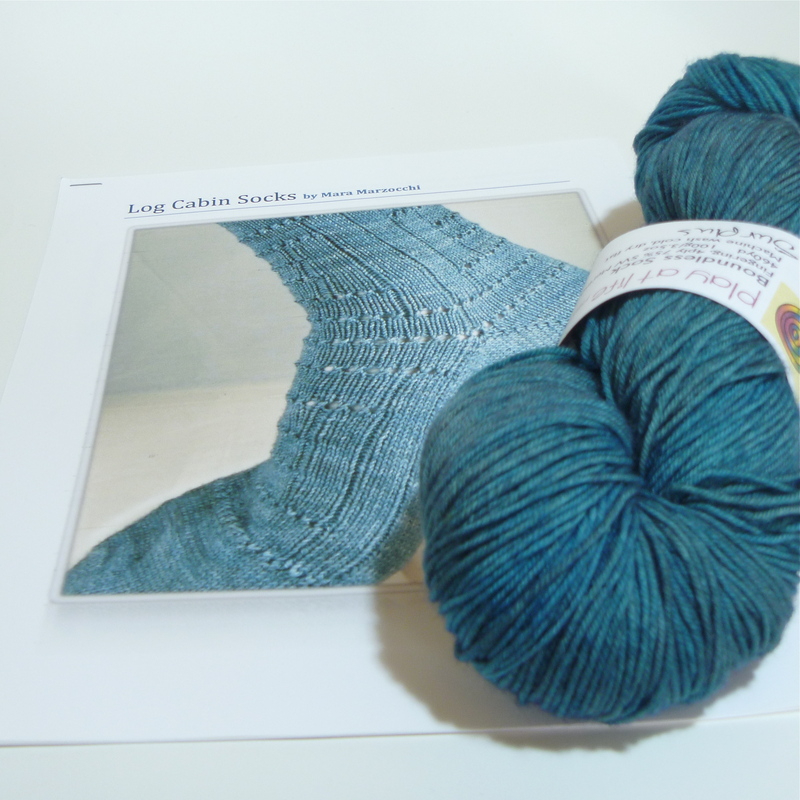 The kit includes a full color print out of the pattern and one skein of Boundless Sock in the new colorway, Surplus. To enter, leave a comment on this post with your favorite snuggle object. A log cabin quilt? Perhaps an e-reader and bottle of port for you fancy types? Sweet dreams of a Cumberbatch/Freeman sandwich? Share the giveaway on your favorite social networking sites for extra entries. Please make a new comment for each site (one entry per site, please!) A random drawing will take place Thursday, February 23rd at 12pm EST. I will contact the winner directly, but will also do an announcement here on Friday. Comments are now closed for entry! Thanks for playing.